Was the fall in oil prices a conspiracy between the U.S. and the Saudi sheiks? Would Russia be ready to help the United States if the need arose? Russian Foreign Minister Sergei Lavrov responded to these and other questions during a recent visit to the office of Rossiyskaya Gazeta. Rossiyskaya Gazeta:Is the U.S. pressure on Europe really that strong? 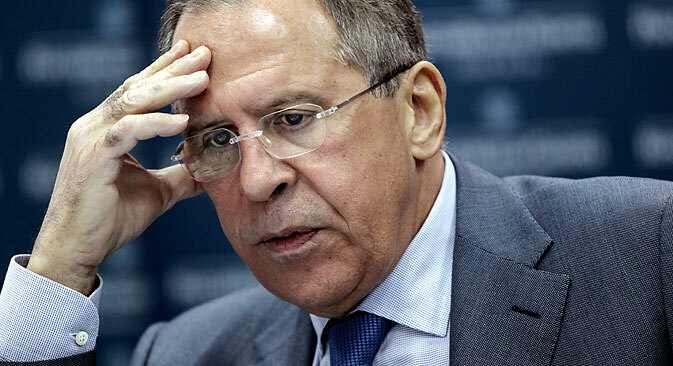 Sergei Lavrov: The pressure that the U.S. exerts is indeed strong. U.S. Secretary of State John Kerry constantly told the Russian president and me, and with great resolve, that everything that is written in Russia about America being against us, creating intrigues against us, against our partners, that America is plotting some kind of "color revolution" is not true. America is not working against us, America is interested in a strong democratic Russia, he would say. All this is for the benefit of solving important problems that concern American interests. But on several occasions I gave him lots of examples of America exerting pressure on its allies. But in the European Union there is always light at the end of the tunnel. Some Europeans do not want to worsen relations with Russia. They do not want to see what is happening now. The most important thing is that now we have the Minsk document, which can be shown as a reference point to those who are demanding certain actions from us. Read the text of the Minsk agreements: Control of the border must be established at the very end of this process. They leave aside the fact that Kiev is obliged to introduce a law on special status and instead turn everything upside down by saying that this is not special status, but occupation. After that it is impossible to justify the preservation of Ukraine's economic blockade of the Donbass. R.G. : Sometimes we get the impression that Ukrainian President Petro Poroshenko is vacillating between Europe and America. S.L. : To a certain extent, yes. But he needs to do so in order not to have the Americans work against him. But when Petro Alexeyevich Poroshenko speaks to Russian President Vladimir Vladimirovich Putin on the phone or when, for example, they held talks in the Normandy Format [the expression used in Russia for the four-party format of peace negotiations on Ukraine (Russia, Ukraine, Germany, France)], he tries to be pragmatic and solve some problems. R.G. : In your opinion, what does the future hold in store for the DNR and LNR? S.L. : On all levels, in comments made by the Russian president and in other formats we always say that we want the republics to be a part of Ukraine. They have just presented their constitutional project, which perfectly outlines the status that is included in the Minsk agreements: The republics will be a part of Ukraine and later they will hold a constitutional reform to strengthen this status on a permanent basis. The project defines what is meant by de-centralization. Moreover, it was German Chancellor Angela Merkel and French President Francois Hollande who wrote that definition in Minsk. R.G. : Does the fact that during the press conference in Sochi U.S. Secretary of State John Kerry made no mention of Crimea mean that the U.S. accepts the existing state of things? S.L. : Not only did he not mention Crimea during the press conference, he also did not speak about it with Vladimir Putin or with me. Draw your own conclusions. R.G. : In your view, is the fall of oil prices a conspiracy between the U.S. and Saudi Arabia? S.L. : I don’t think so. You see, there are many factors at play here. Would the Americans really invest billions of dollars in the development of shale gas, with all its ecological risks, only to "hound" us? That is, they also do damage to themselves since due to the fall in oil prices most of the shale gas deposits in the U.S. have lost their profitability. That means that the American administration would have had to tell the private companies that are developing the shale resources, "Colleagues, you will suffer greatly, but you must endure it." I really don't think so. China's growth has slowed down a bit (and for the Chinese economy even one percent is already a lot) and this has immediately affected everyone. The Saudis do not want to reduce their production or export, even though they are already suffering. They foresee a deficit in their budget, taking into consideration Saudi Arabia's colossal plans. But they do not want to reduce the production for one simple reason: If they leave one market or another, someone else will take their place. They don't like this. I do not think this was a conspiracy. Even though many say that due to this Russia's oil platform is being pulled from under its feet. But I would not support the conspiracy theory. R.G. : Would Russia come to America's aid if the U.S. needed help? S.L. : I will remind you that in 2001 the Russian president was the first to call U.S. President George Bush after the terrorist act of September 11 [in 2001]. We offered our help immediately back then. Then we established a dialogue on the fight against terrorism, even though we did not always feel honesty on the part of our American partners. Nevertheless, whenever America found itself in trouble, whether it was a terrorist attack or a natural disaster, floods in particular, we always offered help. Our people, I think, have it in their blood to help those in trouble.